Review: Keigo Higashino seems to write novels that are meant to become movie adaptations. How else could you explain the amount of adaptations not only in Japan ("Platinum Data"), but also in Korea ("Broken")? 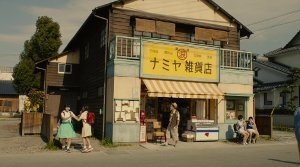 However, "The Miracles of Namiya General Store" seems to be working better as a literary piece of work, because the different plot lines often seem more like an anthology in which the stories are eventually connected to one another. This drama proves to be extremely well produced, being emotional and warm-hearted. Nevertheless, the variety of story lines basically forces the movie to its knees. The drama seems cluttered and the characters, of course, fall by the wayside because of that. However, there are many positive aspects about the movie, which make us overlook these kinds of flaws quite easily. "Namiya" is simply a movie, which wants to make us believe in the good in man again. 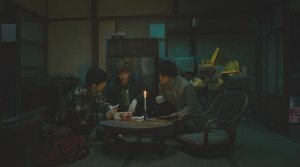 The movie, therefore, clearly has some nostalgic atmosphere. You could even say that the filmmaker wanted to send you back to a time, in which neighbors still cared about one another and in which a store owner could give you life advice. By means of some supernatural circumstance (you might feel reminded of "Il Mare") letters from another time make their way to the store. Three youngsters who might completely have gone astray now see themselves confronted with the responsibility of supporting people from the past with words and deeds. 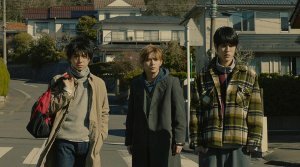 Unfortunately, you don't feel emotionally bound to the three and even Atsuya, played by Ryosuke Yamada ("Fullmetal Alchemist"), remains a blank page and simply embodies the juvenile anger of an adolescent, who is disappointed by grown ups day in, day out. A little bit more color would have been nice. However, there is not really any time for character development. We are presented with a variety of stories that all have something to do with the orphanage. Different sorts of characters repeatedly bump into one another by accident, so that the small town might actually feel rather homey as everybody knows each other. Nevertheless, these sorts of encounters still seem a little bit forced, especially because the movie generally wants to tell an epic story, which encompasses more than three decades. Due to a big budget and great sets, director Ryuichi Hiroki is rather successful at that as well (we'd better not mention his "Strobe Edge" even if the directing is well done there, too). Despite all that the movie has to face some problems when it comes to its pacing. 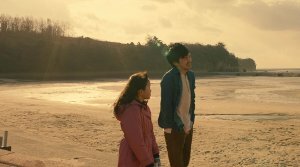 Over and over again, there are moments where the movie basically treads water, even though the rather easygoing pace actually fits the drama. 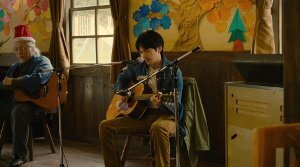 It's not like "Namiya" is too lengthy, there's just too much going on for that, and the movie constantly tries to intertwine the storylines and create a bigger picture. But the director loses his focus far too often within the narration and you sometimes feel as if you were watching episodes of a TV show. Although you don't just get one episode after the other but rather a web of different storylines. It's just obvious that the movie medium isn't able to keep up with the possibilities of storytelling within a novel. The movie seems a little too ambitious. You might be emotionally touched at the end and feel as if you had watched a three hour movie (even if it's just 129 minutes) but what is left is simply an entanglement of different threads, which admittedly are sown together, but not in the best way possible. A little fine-tuning of the novel adaptation process would have been nice. Sure, there is some drama here, as well, but it is used to show us the goodness of human nature, and it indeed manages to give us a warm and fuzzy feeling. 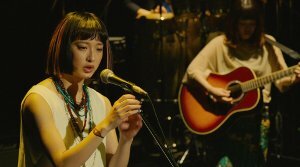 There is some time-travelling, a ghost in form of Akiko as well as a musically oriented story. And within these and the other colorful storylines there are always at least two threads that connect everything to a whole. 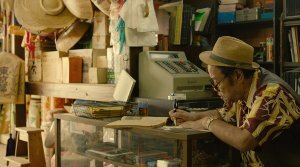 This gives "The Miracles of Namiya Store" a more or less artificial seeming touch, but in the end, the director manages to put the story on screen in a rather advantageous fashion. Thus, my conclusion is: It's not hard to follow the plot and, despite all the artificialness, it even is a lot of fun to see how everything is connected. However, you can't deny the fact that the original novel probably had better options to flesh out the story's characters and story threads.